Ten years after the first film, in the greek island of Kalokairi, Sophie is pregnant with Sky’s child while running her mother’s villa. Self-conflicted because she can’t do it by herself, but with Tanya and Rosie’s guidance, Sophie will find out more of Donna’s past and how she came to start up her villa, met each one of Sophie’s dads and raised a baby, bravely all on her own.The premiere is on tonight, Tuesday the 17th of July at 8:00 P.M at VOX Lebanon with a customized WHITE party, with dancers, live entertainment, special seafood and cocktails stations. MAMMA MIA cast: Amanda Seyfried, Meryl Streep, Pierce Brosnan. Discover Donna’s (Meryl Streep, Lily James) young life, experiencing the fun she had with the three possible dads of Sophie (Amanda Seyfriend), EXCLUSIVELY AT VOX LEBANON, CITY CENTRE BEIRUT. In a nation where not all burgers are created equal, Espresso Patronum decided to find out where animal style continues to reign supreme, particularly in the big apple: NYC. In-N-Out Burger has once again topped Market Force’s annual customer survey of the nation’s top quick-service restaurants; a beloved California-based burger joint, earning a 76% rating in customer loyalty. That’s higher than any restaurant in any category, even though the chain is famously limited to only the West Coast. It’s a redemption of sorts for In-N-Out, which added its first new menu in 15 years earlier this year. While In-N-Out Burger won the Market Force survey last year, Five Guys bested it in a separate Harris Poll last year. Chick Fil-A came in second in the overall rankings, with 73% customer loyalty. Other big winners included Raising Cane’s, which specializes in fried chicken. Missing from the customer loyalty survey were the biggest national chains: McDonald’s and Subway. The 2 chains were completely left behind in favor of regional favorites. 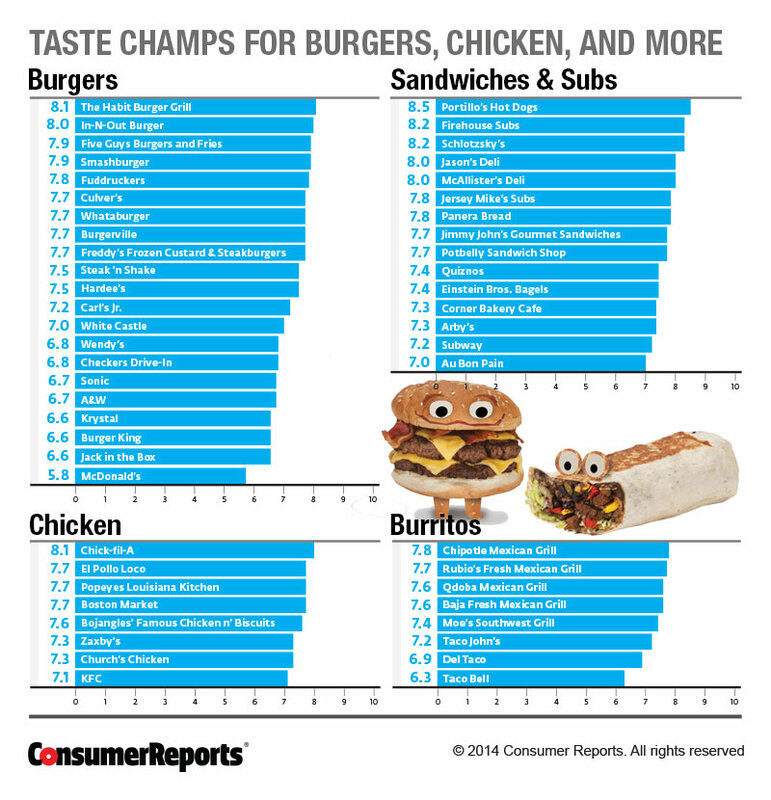 Consumer Reports asked its subscribers what fast-food restaurant had, in their opinion, the tastiest food. A trend soon emerged where the biggest fast-food restaurants ranked the lowest in customer preference. For example, KFC was voted last for chicken, Taco Bell was the least liked for burritos and, sorry Jared, but Subway’s sandwiches were only beat by Au Bon Pain as least favorite among the American public. As for McDonald’s? Americans are seriously not “lovin’ it.” “McDonald’s own customers ranked its burgers significantly worse than those of 20 competitors, including Hardee’s, Shake Shack and Wendy’s. No other house specialty scored as low,” Consumer Reports noted, as reported by NBC. Although America may be dubbed the “Fast Food Nation,” recent reports show that New Yorkers are more concerned with the quality of food than the convenience of the location. Despite how the world views the U.S, Americans & New Yorkers in particular actually want to eat good quality food.